It's time for Follow Me Back Tuesday. All you have to do to join is is follow the four hosts, Survey Junkie, Little Yaya's, Review Retreat, Boobies,Babies,& A Blog,and their guest host for the week. This week their guest host is Dolly, from Xmas Dolly. Make sure you leave them a comment to let them know you've stopped by. They will follow you back. Then, you grab their button, add your Follow Me Back Tuesday post to their link, (you only have to add it once,) and start following. You follow as many people as you want. This is a great way to gain new followers and make new blog friends. Make sure you leave a comment on everyones blog that you follow so they know you have been there. Please follow others back. Hi I'm the guest host from Follow me Back Tuesday just stopping by & returning your follow. Sure hope you checked out my give-aways too! THANKS! So anyway, hello! Nice to meet ya! Now I must go browse a bit, and keep hopping! Have a great day! Thanks again! Hi there...new follower from FMBT! I love your blog...the colors just pop! Stop by sometime and say hi! Just stopping by through the Follow me back Tuesday linky to check out your blog. Hope you can come and follow back! Lots of ecofriendly giveaways and coupons/freebies you may find usefull! I'm a new follower from FMBT. I am happy to have found you. I look forward to reading more of the 4M Project. Hey... and Thank you for your (& your husband's) service. So many sacrifices made. Hiya! I'm stopping by from FMBT... your newest follower! I LOVE your blog!! Stopping by from FMBT. I am your newest follower. Would love it if you came by for a visit as well. 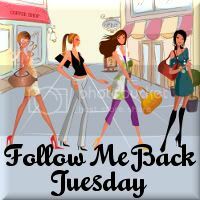 following via follow me back tuesday. would love to have you follow back.